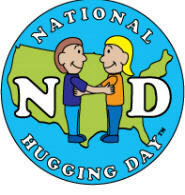 National Hug Day or National Hugging Day is an annual unofficial event devised by Rev. Kevin Zaborney now residing in Caro, Michigan USA. It occurs on January 21 but is not a public holiday. The day was launched on January 21, 1986 in Clio, Michigan, USA.There are reports of it being marked in some other countries. The idea of National Hug Day is to encourage everyone to hug family and friends more often. Zaborney cautions to ask first if one is unsure of the response. Whether you hug a family member or a friend or a stranger, the mental and physical health benefits are the same. Kevin Zaborney is credited with coming up with the idea of National Hug Day in 1986. It was included in Chase’s Calendar of Events; Zaborney’s partner at the time was the granddaughter of the proprietors of the publication. He chose January 21 as it fell between the Christmas and New Year’s Holidays and Valentine’s Day, when he thought people are generally in low spirits. Zaborney considered that “American society is embarrassed to show feelings in public” and hoped that a National Hugging Day would change that, although he thought that his idea would fail. A 2003 study by the Touch Research Institute at the University of Miami Medical School found that American couples spend only one-third of the time touching that French couples spend. Studies have shown that human contact has many health benefits. It has been found that human contact improves both psychological and physical development. Hugging can also help build a good immune system, decrease the risk of heart disease, and decrease levels of the stress hormone cortisol in Women. It has been shown that a couple who hugs for 20 seconds has higher levels of oxytocin, and that those who were in a loving relationship exhibited a highest increase. Eight or more might seem quite high, but while researching and writing this article I asked my child, “How many hugs a day do you like?” She said, “I’m not going to tell you how many I like, but it’s way more than eight.” That really made me smile and touched my heart. And, I realized how organic and deep the need for hugs is. International Hugging day (hug Day) 2014 will be celebrated on the 21th January 2014 world wide. After few days International Hug day will be celebrated and hope you are looking for Hug day HD wallpapers or Hug day 2014 quotes to wish and hug your Dear one on this Hug day 2014.In some counties Hug day is celebrated before the few days of the Valentines day. Enjoy the cool and latest Animated Hug day Hd wallpapers and images to share.